He picked up the VHF radio. “Tenacatita fleet. Tenacatita Fleet. This is Penelope.” He announced he intended to anchor our dinghy near the northwest shore. Everyone is invited to join us for a raft up at 5:00 pm. Oh, brother! Now my little gadabout is planning parties! 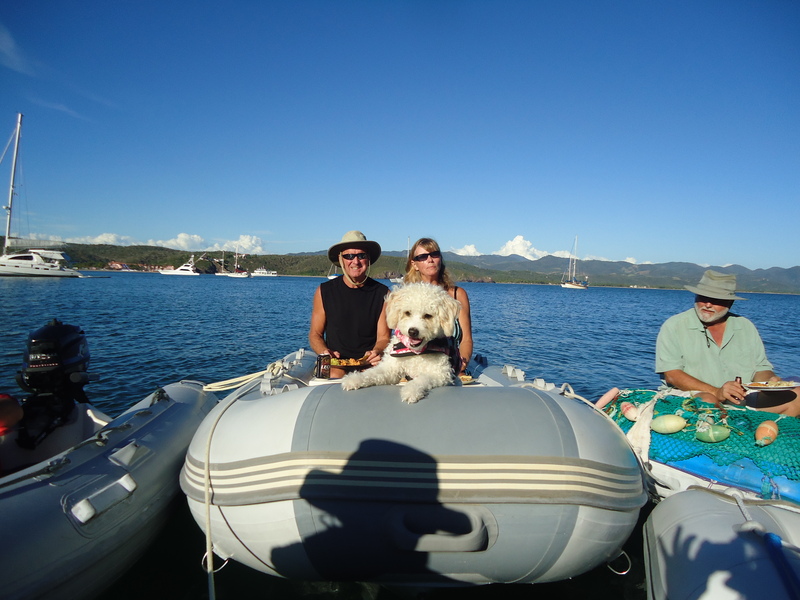 At 10:00 am, we left in the dinghy to motor over to La Manzanilla. 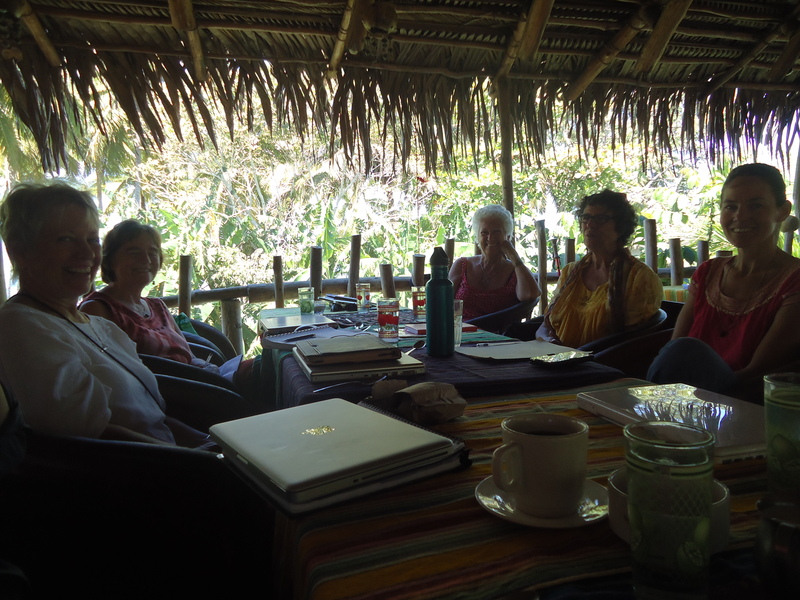 The local paper, The Pelican, advertised a writing group which meets each Saturday morning at Martin’s Restaurant. I was warmly welcomed into the group of seven other women and one man, all Americans or Canadians. We went around the table and each person read a piece he/she had written. The stories were varied. A poem about living in Manhattan, a call to engage more fully in stewardship of the environmental, a posthumous letter to one woman’s diseased sister. The quality of the writing was suburb. I was totally inspired to write, which, of course, is the purpose of a writing group. After two hours, I thanked them profusely and promised to return next Saturday if we are still here. Once home, I hurriedly washed a load of dark clothes in the Wonder Wash and got them hung on the line to dry. Peter made a bowl of guacamole to take to his party. Just before 5:00 pm, we motored the dinghy to the northwest side of the bay. One at a time six other boats joined us. We poured wine and popped open beers. 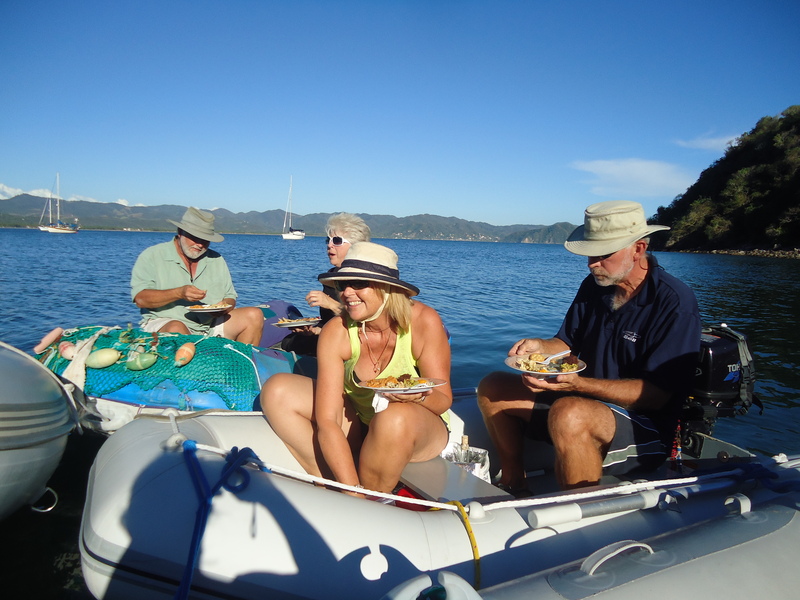 After some small talk, we pulled out plates, silverware and napkins and began to pass a smorgasbord of varied dishes from one dinghy to the next. Curried chicken, artichoke pate, rice and beans, guacamole and brownies for dessert. Peter took the stage and asked each couple to introduce themselves and describe where they have been and where they plan to go. There was a couple from Florida who have been cruising for 14 years and a couple from Meridian, Idaho who have been cruising for 13 years. Another couple cruised with their children for a year 20 years ago and are doing it again in their retirement. The others had each been underway 2 – 5 years. With just 200 days under our belts, Peter and I are the newbies on the block. Just before dark we disentangled the dinghies, one from the other, and each motored off to our respective “homes”. I felt proud of Peter for putting us all together.